Nuosu SIL was formerly called SIL Yi. 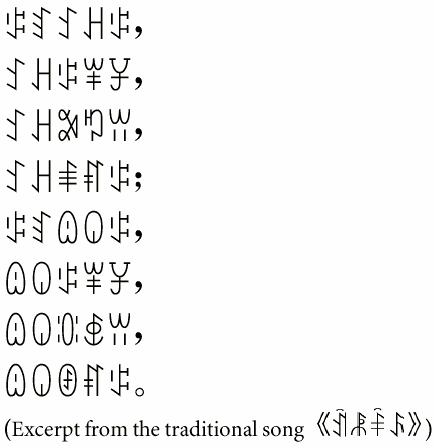 The font includes a complete set of Yi syllables and radicals (as defined in The Unicode Standard,), a basic set of Roman glyphs and various punctuation. Yi Radicals which were added to Unicode 3.2 (U+A4A2..U+A4A3, U+A4B4, U+A4C1, U+A4C5) are now included in the font. Representative samples are below. Nuosu SIL is designed to work on systems and with applications that provide support for TrueType fonts and for Unicode character encoding. It does not include any smart font behavior. You will need to use a keyboard program, but can use any Yi Unicode keyboard you prefer. We do provide a minimal Keyman keyboard which can be downloaded below. It does not provide keystrokes for the Yi Radicals which were added to Unicode 3.2 (U+A4A2..U+A4A3, U+A4B4, U+A4C1, U+A4C5). Nuosu SIL is released under the SIL Open Font License (OFL), version 1.1. Copyright (c) 2000-2008, SIL International (http://scripts.sil.org/)., with Reserved Font Names "Nuosu" and "SIL". If you wish to receive announcements about updates to Nuosu SIL, or any of our SIL fonts, please go to this page to subscribe: SIL Font News subscription. This installer is only for Windows users. Once the package has been downloaded, you can double-click on it to install the fonts and documentation files. After installing, you can read the documentation files at Start / All programs / SIL / Fonts / NuosuSIL. This package contains the source files for creating the font. This is an installer for a Yi Keyman keyboard. This keyboard was developed for keyboarding Yi. The SIL Yi font is not a part of this package, as you should be able to use any Unicode Yi font with the keyboard. If you download this package, you must have Keyman already installed. (For guidelines on who can use Keyman and for downloading, go to: http://www.tavultesoft.com.) You can just double-click SILYiX11.kmp to install the keyboard package. Once installed, the readme file can be found at Start / All Programs / Yi Keyman Keyboard. There is only minimal documentation. There is no keyboarding chart. An older version of the SIL Yi font is still available here. 19 April 2007 Version 1.2 OFL release. 10 April 2000 Version 1.1 released.